The Pizzeria Pronto® is a revolutionary new pizza oven from the makers of Pizzacraft. Patented technologies allow the Pizzeria Pronto to create pizzeria-quality pizzas at home or on the go, fast and easy. The oven pre-heats in 10 minutes and cooks a pizza perfectly in 5 minutes – and then is ready for another pie! The ultimate portable outdoor pizza oven! The Pizzeria Pronto runs on propane, making it incredibly mobile. You can bring it with you to a tailgate party, on a camping trip, barbecues, or a picnic at the park. It pre-heats to 700°F in 10 minutes and cooks pizzas in 5 minutes with no re-heating time in between pies. The interior features dual cordierite baking stones that come together with a hollow core of air in between, which acts as a heat diffuser and eliminates the risk of hot spots on your stone. A reflective heat shield built into the top of the oven redirects heat down onto the top of the pizza so toppings cook at the same rate as the crust. It runs on a 20 lb. or a 1 lb. tank with an adapter. The Pizzeria Pronto was featured on The Talk as a “Summer Party Essential“. Impress your backyard barbecue guests with quick, easy and delicious pizza! The outdoor pizza oven was also voted one of “12 Tailgating Essentials: Best Gear” by Men’s Journal in their October 2013 issue. Include this rugged and portable outdoor pizza oven as one of your must-have tailgating accessories! The Pizzeria Pronto was featured on Lakesha Rose’s “Tailgating Round-Up” segment on WGN Chicago. Lifestyle expert, Limor Suss included the Pizzeria Pronto in a “Tailgate in Style” round-up on PIX11-TV. We know how important consumer reviews and critiques are when making decisions on which pizza oven to purchase. Here’s a few sites for you to reference. Chowhound offers a nice compilation of comments and reviews from consumers on the Pizzeria Pronto beginning with its release into the market in 2013. Oven Reviews HQ gives you a step by step review along with tips and trick to Pizzeria Pronto cooking success. The Companion Group does not sell direct to consumers. 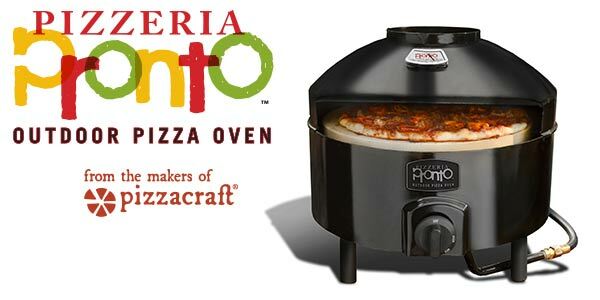 The Pizzeria Pronto pizza oven is available through select specialty retailers and online at pizzacraft.com. Download The Companion Group’s Minimum Advertised Price Policy. *Additional resources and information for Pizzeria Pronto owners.